Knee pain be the most frustrating injury to have. It affects your daily activities. It can take months to go away. Of course it is best to add special exercises to prevent knee pain but sadly what do you do if you are already experiencing pain? 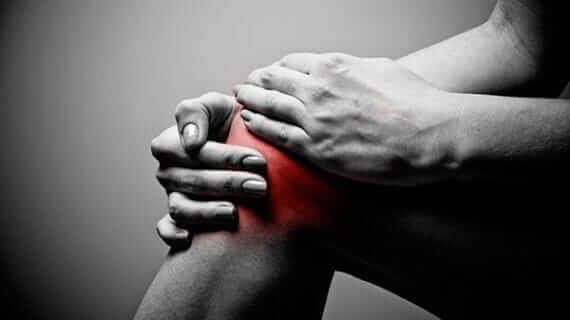 Your knee pain could be the result of two factors, muscle imbalances and overuse. What is muscle balance? Efficient movement and joint heath requires a balance of muscle length and strength around a joint. If muscles are not balanced, then the related joint is directly affected. What is an overuse injury? Simply they are the result of repetitive micro-trauma to the tendons, bones and joints. You sit at a desk all day. Sitting all day at a desk with your hips flexed causes your quad and hip muscles to become tight and your glute and core muscles to become week. This weak and tight relationship at the hip joint can create a muscle imbalance and cause pain at the knee. Your Squat Technique needs improvement. If any of the following describes your squat technique we may have just discovered the issue. 1. Your knees fall inward during the descent of the movement. 2. Your knees flex past your toes during the descent of the movement. 3. You perform half squat reps. Thus over developing the quads and under developing the glutes and hamstrings. SIDENOTE: Do a quick audit of your workout. Do you squat without worrying about your posterior chain muscles (low back, glutes, and hamstrings)? You do more push exercises (Back Squat, Front Squat, Lunges, Box Jumps, etc….) than pulling exercises (Deadlift, Romanian Deadlift, Leg Curl, etc…). You run long distance 3-5 days a week without proper strength training. You enjoy slow, long distance runs. That is great, but you have developed knee pain. That is most likely because again the quads and calves have become over active while the hamstring and glutes have become under active. Namely because during slow, long distance running the quads and calves decelerate the body each stride. Because of that emphasis on deceleration, there is no acceleration from the hip extension to propel you forward (like sprinting). Therefore with hip extension you have no glute and hamstring activation. So you need to add 2 days a week essentially working on the muscle that support all your miles. Standing with your feet straight ahead and about shoulder width apart, place a mini band around both ankles, just above your shoelaces. Start the movement by pushing your left foot into the ground and stepping laterally with your right foot, about 6–10 inches. Plant your right foot on the ground, and pick up your left foot—slow and controlled—and step about 6–10 inches to return to the original shoulder width set up. This constitutes one rep. Continue for the programmed reps. Standing with your feet straight ahead and about shoulder width apart, place a mini band around both knees just under the knee caps. Squat down to about one-half to three-quarters depth, with your knees directly over your big toes. Maintain this position for the entirety of the exercise. Initiate the exercise by pushing your knees out against the mini band until the inside edge of your feet come off the floor. Pause for 2 seconds and pull your knees back over the big toes. This constitutes one rep. Continue for the programmed reps.
With your foot elevated on a physio ball, lie on the floor on your back. Relax your arms, leaving your palms up by your sides. Begin the movement by pulling one knee into your chest (taking your foot off the physio ball), and then pushing your opposite heel into the physio ball and driving your hips up until you reach full hip extension. Attempt to create a straight line from your knee through to your shoulders. This is your bridge position. Squeeze your glutes at the top for 2 seconds before returning to the starting position. Repeat for the required number of reps. Assume a half-kneeling position with the right knee down and left knee up, with your rear foot elevated to about 14–18 inches above the floor. (The back foot is elevated to enhance the stretch’s impact on the quadriceps.) . Keep your chest up and shoulder blades tight and back, and initiate the stretch by contracting your right glute muscle to rotate your hips into a stretched position. Hold this glute contraction and slowly shift your hips forward. Hold the stretch for 30–45 seconds. Relax and repeat for the other side. You may hold onto an anchor point for balance if needed. For Increased Difficulty: Grab your right ankle as you shift your hips forward. Kneel on the floor and grab the ab wheel with both hands while assuming a kneeling, push-up position. Contract the glute muscles and slowly roll the ab wheel forward. Your hips will lower at the same rate that your hands roll forward. Caution: Only roll as far you are able to while still maintaining a neutral spine and contraction of the glutes. Start by adding in 1 or 2 exercises (2 sets x 10 reps per exercise) each day before your run or before you hit the gym to squat. Progress by adding in 1 or 2 exercises daily (2 sets x 10 reps per exercise). Next, progress by increasing the volume (reps x sets) of each exercise. Nothing is worse than having pain that affect your daily activities. Take some extra time to strengthen your weak muscles to alleviate some pain so you can get back to doing what you enjoy. Also, if you are truly in pain please go see your physician and seek a medical opinion. For over 100 mobility based exercises for the everyday athlete and 20 sport specific workouts please pre-order The Mobility Workout Handbook: Over 100 Sequences for Improved Performance, Reduced Injury, and Increased Flexibility now! Military Fitness, Sports Performance, Strength & Conditioning, Workouts abdominal workouts, balance, dumbbell workouts, injury prevention, Knee Health, Knee Mobility, Mini Bands, muscle gain, running, squats, weights permalink.